On Sunday, the Washington Times reported a story about the “violent crime surge” in Washington, D.C., in the first month and a half of 2012. The article states that violent crime is up 40 percent over the same period (January 1 through February 16) last year, with homicides, sexual assaults, robberies, and aggravated assaults rising at an “alarming pace.” While the Times analysis is factually correct, the numbers are less alarming if other facts are considered. Figure 1 shows our analysis of the same data (overall violent crime in D.C.) for the first six weeks of the last 13 years. We find a slightly smaller increase in violent crime (32 percent) from 2011 to 2012 than the Times reported (40 percent). By placing these data in a longer time series, it is apparent that violent crime in the first six weeks of 2012 fits neatly into long-term trends. 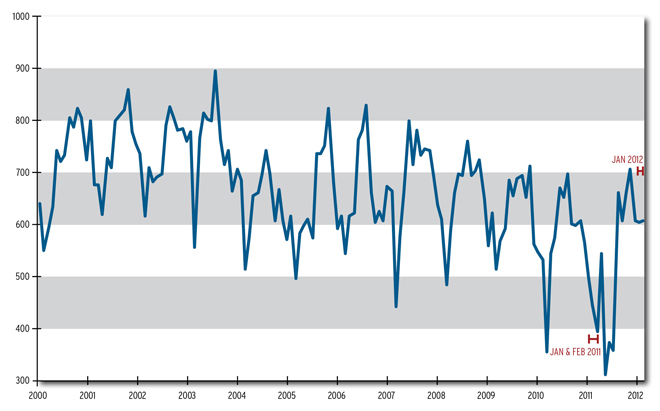 As Figure 2 shows, violent crime in early 2012 also fits neatly into long-term monthly patterns. 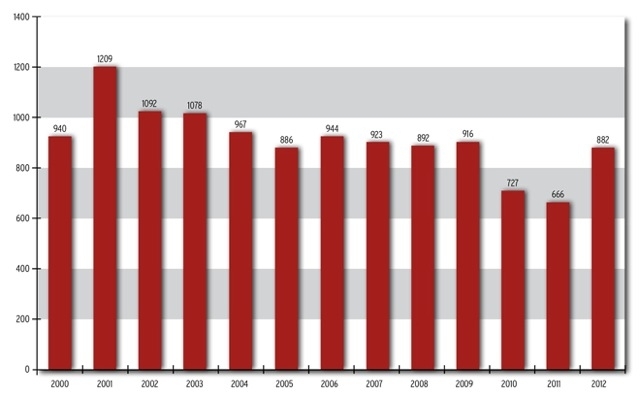 However, these annual reports mask the fact that crime is extremely volatile (A brief produced by the District of Columbia Crime Policy Institute [DCPI] takes up this issue). Seasonal effects and seemingly random events will trigger brief crime spikes and brief crime declines. What skews the comparison is that violent crime in January 2011 was in a brief crime decline, likely triggered by the volatile nature of crime rather than by any long-term trend. 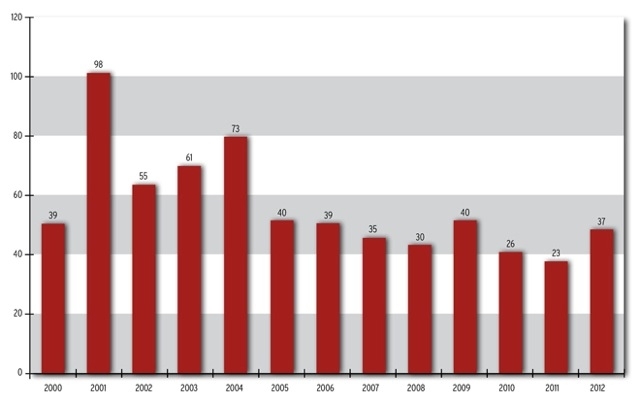 Crime in January 2011 was lower than in all but six of the 146 months in this series. So, as crime rates return to more typical levels, comparisons with an anomalously low violent-crime period create the illusion of a crime spike. The Times story also expands on robberies in the 2nd Police District, which have been the focus of many news reports lately. The article reports that 70 percent of violent crimes in the 2nd District were robberies. However, this robbery rate is also in keeping with long term trends—since 2000, robberies have accounted for between 50 and 80 percent of the violence in the 2nd District, and in fact, for the city as a whole. As is the case for all violent crime, 2nd District robberies in 2012 are within the range observed over the last eight years, which is somewhat lower than in the early part of the decade (Figure 3). We aren’t suggesting that violent crime is trivial or that it should be ignored. But an informed policy response should consider long-term trends and the volatile nature of crime over short-time periods. A spike in crime over a six-week period is not sufficient to suggest that the long-term downward trend in crime has reversed itself; it’s far too early to tell. The news is not all bad however. Recent polls have suggested Americans have become rather complacent about crime, and these short-term changes in the amount of crime serve as a reminder that people, especially those who live and work in urban areas, should take necessary precautions at all times. And the reaction of police to short-term changes in offending—extra patrols, plain-clothed officers, call-ins of criminals on parole, and probation—are an important reason most crime spikes do not turn into long-term trends. In summary, residents in urban areas should always be alert, regardless of the short-term crime trend. And they should be especially cautious of headlines screaming about crime surges.